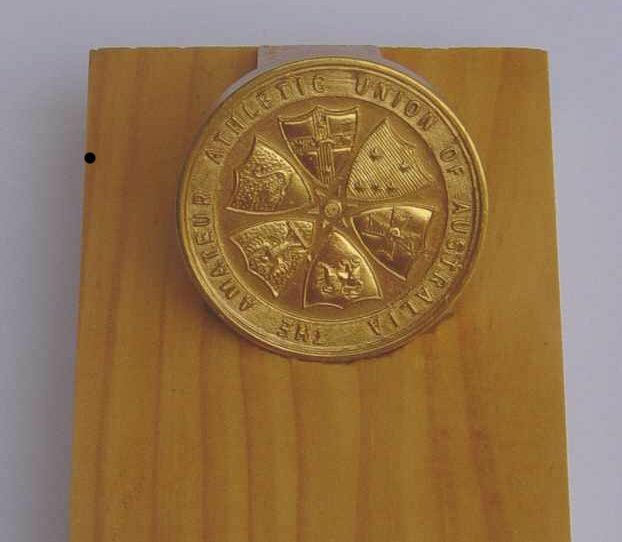 In July 2006, we accepted a wonderful addition to our VRWC trophy cabinet, compliments of VRWC life member Ray Smith – his 1956 Australian 50 km Championship gold medal. The story of this medal underlines it's significant place in Australian racewalking history. In the late 1940's and early 1950's, Ray was one of our top sprint walkers, excelling on the track and over the shorter distances. Consequently, many people were surprised when, in 1954, he decided to train for the 1956 Olympic 50 km event. Working under the watchful eye of legendary coach Percy Cerutty, he upped his mileage and worked hard on his fitness. His first outing over the 50 km distance was on 27 August 1955 in a VAWC 50k club championship race over the Olympic course. According to his training diary, he retired at the 21 mile mark with leg problems. Five weeks later he fronted for the 1955 Victorian 50 km championship on 1 October. He led all the way on the tough out-and-back Showgrounds/Rockbank course only to be caught and passed by Jim Short as he left Ballarat Road to go down the hill and on to the showgrounds. The loss spurred him on. He had finished his first 50 km event and this, combined with his top position in the Australian ranking over the 20 km distance (1:39:24) gave him a lot of confidence as he headed towards the Olympic trial. His next outing over the 50 km distance was the 1956 Australian 50 km title race and Olympic trial. This event was held on the Olympic Games course on Sunday 9 September 1956, starting and finishing at Olympic Park rather than the MCG. Walking a wonderful race, he finished 2nd to New Zealander Norm Read (who went on to win the 1956 Olympic 50 km race). Ray’s time of 4:40:24 broke the Australian and Victorian Residential records and and won him the Australian Title. It also gained him selection, along with Ron Crawford and Ted Allsopp, in the 50 km for the 1956 Olympic Games. His success was never contemplated by the Officials Selection Committee. Most athletes in those days officiated whenever possible and he had been named as an official well before the trial. In fact, he had already collected all the officials uniform in preparation for his role as an official. Smith surprised. A former track champion, Smith had only walked in a 50-kilo event once before and took more than five hours. Yesterday, he stuck to his task gamely and finished nearly five minutes ahead of National record holder Ron Crawford (N.S.W. ), clipping 10 min. 39.8 sec. off Crawford's mark. Defending champion Les Hellyer collapsed about seven miles from the finish. The 41 year old Hellyer said he suddenly felt sick and light headed. He started to stumble around in circles and fell across a parked car before attendants got to him. Ray's fourth and final 50 km race was the Olympic event in November 1956. His racing strategy tells the story. He led through the 5 km mark with Abdom Pamich and held on with the lead group until the 10 km mark. Then he faded in the hot conditions, passing the half way mark in 10th place. On the long return trip home, his Portsea training saw him come to the fore and he passed a number of flagging walkers to finish sixth (4:56:08). It was a finely judged race in hot conditions.